Roberto Vizcaino Guillot is an adjunct professor at two of Cuba's leading institutions for higher music education - the Instituto Superior de Arte and the Amadeo Roldan School of Music, both based in Havana. He is a member of the faculty of traveling professors who teach in foreign countries through the Instituto Superior de Arte of Havana, Cuba. 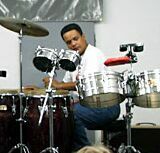 He began his musical studies at the "Escuela de Nievel Elemental Alejandro Gracia Caturla" interesting himself in the knowledge of the percussion world. He continued his studies at the Amadeo Roldan School of Music. As a percussionist he has worked with outstanding musicians such as Clark Terry, Luis Perico Ortiz, Peter Erskine and Dizzy Gillespie. He joined the group "Diakara" which accompanies the singer/composer Silvio Rodriguez.